home > research > urban corridors > urban corridors as social sculptures > GROWING FOOD FOR THE HUNGRY CITY: IS IT STILL ART? GROWING FOOD FOR THE HUNGRY CITY: IS IT STILL ART? More and more people are living in the cities. We have to search for new modes of sustainable living, new ways of food production. Re-examine the link between the city as consumer and the countryside as provider. 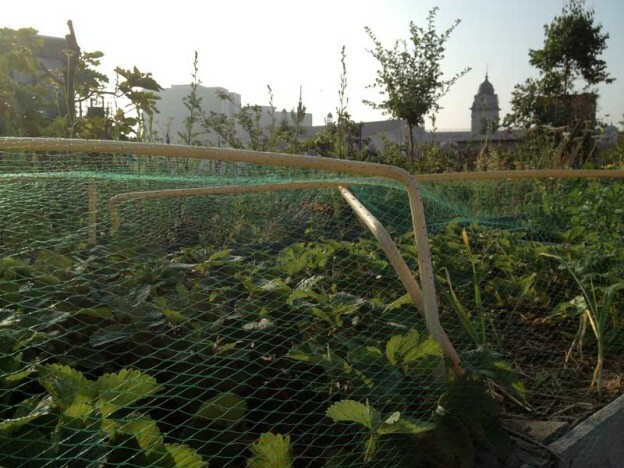 In this context, we are researching how to make a network of intensively cultivated city rooftopgardens where we can grow our own food for the neighbourhood. we want to blend the natural and the digital in one and the same nature. We study and document how to set up a middle sized rooftopgarden (± 700 m2), all with recycled materials. Artists occupy the public space and develop activities with a specific ecological focus: hack the top level of city and give it another destination. Connect different rooftops in a network of OpenGreens with city honeybees as connectors and bio-indicators. The Urban ArtFarm project blends nature and technology. By digital means it explores how the growth, blossoming and decay of plants occur while they are submitted to different abiotic elements as wind, rain, sun, etc. Can we learn something from the data resulting from the monitorings? Is our environment programmable? Does the fusion of natural and artificial matter produce new organisms, new environments, new natures? Elements of the garden, plants as well as technology, become nodes in wireless networks. This happens both on rooftop level as on city level. The connections between people, plants, sensornetworks and utilities of the rooftopgardens are mapped for further study. We research the collected data in the context of the 3 ecologies (Guattari, 1969) : ecological, social and political. This entry was posted in urban corridors as social sculptures and tagged corridors, media ecology, urban agriculture on 04/11/2013 by admin.